Not to be confused with its embattled neighbour to the east, the Democratic Republic of the Congo, the Republic of the Congo offers the same magnificent wilderness, the same mighty river, but with less political instability, making it a far more desirable travel destination. The northern rainforests are virtually uninhabited, or rather, are uninhabitable because of the dense undergrowth and vast swampland. A whopping 85 percent of the population reside in and between the capital of Brazzaville and Pointe Noire, only 332 miles (534km) apart, and these are the main areas that are visited by foreigners. While the Republic does not have a well established tourist industry, having recently emerged from six years of civil war, there is still plenty to do in the Congo. The Odzala-Kokoua National Park is one of the largest in Africa and revered for its conservation of forest elephants and the western gorilla. 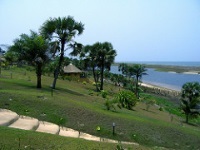 Brazzaville, located right on the banks of the Congo River, is a popular pitstop for travellers seeking out nearby adventures such as white water rafting or jungle trekking. Down the rail line, in and around the coastal town of Pointe Noire, one can savour the warm, if somewhat narrow, beaches of the Atlantic Ocean while visiting the museums in Diosso Gorge and the nearby Tchimpounga Chimpanzee Rehabilitation Centre. Since the peace accord in 2003, the Republic of Congo has been fairly peaceful, although there are still a few regions in the country which are best avoided, and sometimes conflict in the Democratic Republic of Congo can spill over across the border. Although not known as a popular tourist destination, the Congo is an exciting country to explore for those with a taste for adventure and a desire to get off the beaten path. We are looking for contributors for our Congo travel guide. If you are a local, a regular traveller to Congo or a travel professional with time to contribute and answer occasional forum questions, please contact us.